The party at the hotel Les Gavines, S’agarò, Tossa de Mar. We emphasize this event that took place in Les Gavines hotel because it was a very well-crafted event. It was a wedding in which it was decided to set it as possible and within the Mexican culture. All guests arriving and receiving Michoacán blankets and Jalisco hats, family members celebrating their anniversary were all wearing elegant white charro outfits, including children, and everything was decorated in the style of a traditional festival there. To receive guests we formed, along with some colleagues a group of Veracruz music that was located at the entrance of the enclosure and interpreted classical repertoire pieces like Crazy Jarocho syrup, la Morena or the cú bird, among others. After celebrating the traditional piñata to the delight of all the children we sang some traditional songs of the situation…. Before dinner there was a first performance of mariachi accompanying a group of traditional dance from different regions of Mexico, who also made a little animation and led the guests to dance polkas some songs with the group. During dinner mariachi singing songs to accompany the evening and were surprised that some of the guests knew something of our repertoire and then even encouraged to sing with us. 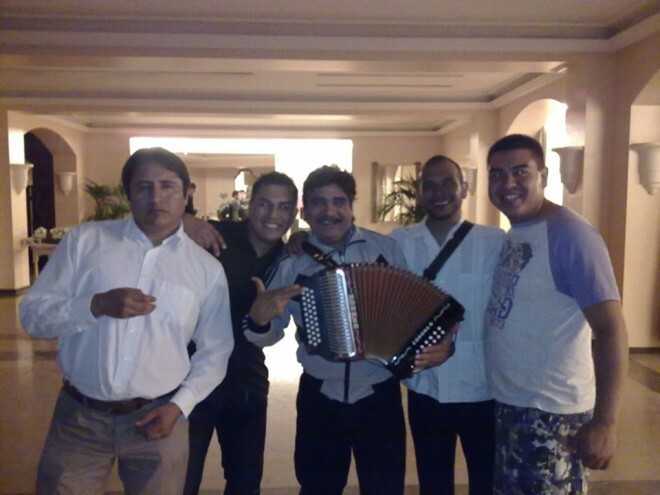 By the end of dinner they had set up a stage and had prepared a concert with the great Mexican accordionist Celso Piña and his group who were touring Europe and took the opportunity to bring to the party. Celso Piña is a pioneer in Mexico in leading music like cumbia, which is originally a Colombian tradition, a fusion with reggae and hip hop throughout what is called the sonidero movement in Mexico of predominantly urban nature. He has worked with great artists of Mexican music as Lila Dawns or Gloria Trevi. We were able to enjoy their concert where viewers were not more than 30 people and he was kind enough to accommodate our requests. We were finally able to live with him for a while. It is always a pleasure to share experiences with artists of his stature.